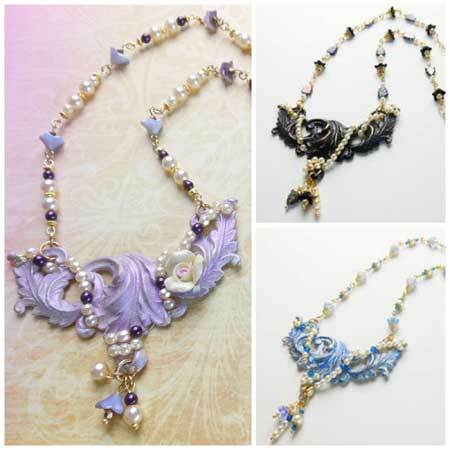 As you may or may not know, the main supplier of componenets for the jewelry I make is B'Sue Boutiques. Every month the B'sue Boutiques Creative Group has a group challenge with a theme for all members of the Facebook group B'Sue Boutiques Creative Group. As a member of the B'sue Boutiques Design Team, I try to participate in each month's challenge. These challenges encourage growth and expansion in our design skills and imagination and result in lots of sales! SEPTEMBER'S CHALLENGE is Vintage Flair. Our goal was to create a statement piece with a vintage feeling, but driven by fashion trends. We were given a choice of four different main components (shown to the left) to work with, but to really Change it Up! To use these components in a different way than before, that has a vintage look with a flair to it! 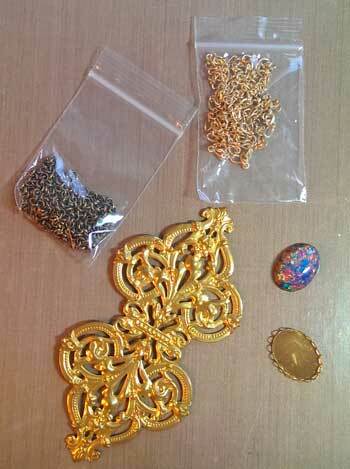 These are all great components to work with and I've used several of them in jewelry designs in the past. 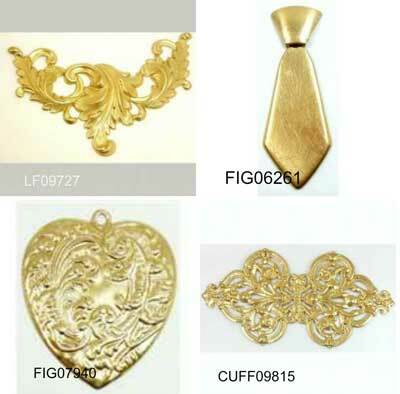 Below are four necklaces that all use the same center piece as shown in the upper left of the photo above. 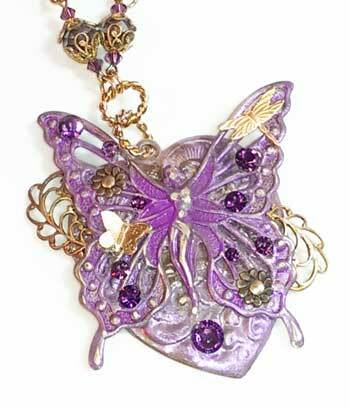 And here is a necklace I made for my niece (who loves purple like I do). This one uses the heart in the lower left. But this is a challenge and vintage FLAIR, so which way to go? Now, "fashion " has never been my thing. At least the accepted fashion of the moment. I've always set my own style...right or wrong...I choose what works for me. So, that got me to thinking. What is "vintage" really? Well, our fearless leader, Brenda Sue Lansdowne, gave us a "CLUE: Right now you will see A LOT of Boho, Retro, Hippie Chic and 60's style looks reminiscent of that time period". Well, that's all I needed to hear. As a former (and possibly current) "Hippie chick", the Hippie Chic style called to me. So this is what I started with. The large cuff stamping, a beautiful simulated Czech fire opal, a bezel and some chain. I then decided to cut the cuff in half and paint it using Perfect Pearls in my favorite colors that matched the stone (I decided to forgo the browns, oranges and golds of my former Hippie life). 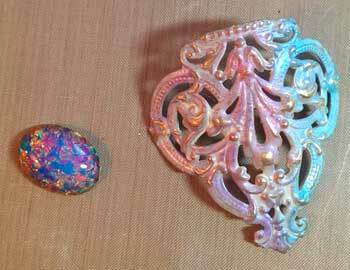 I then added some spectra beads, a tiny flower locket (flower power! ), all from B'Sue Boutiques, and made it into a SLAVE BRACELET! Boho, Hippie Chic Vintage Flair! I could have worn it then and I will wear it now! And, I don't think the final result looks at all like the full cuff stamping I started with. So, that's it for me for this challenge! If you're a designer or would like to get involved in making jewelry with a fun group of people, come on over and join us in the B'Sue Boutiques Creative Group on Facebook! We'd love to have you!! One other note: I'm also a graphic and web designer, and Brenda asked me to design the blog badge that you see on the upper right of this blog and on many of the other blogs too! To see more fun vintage chic designs, please visit the blogs of my amazing blog parters in this challenge by clicking on the links below. Thanks for stopping by and enjoy! Please feel free to leave a comment. We appreciate the feedback! Stunning colors.Great piece of work. Great Blog Hop Badge, also. Your bracelet turned out lovely and many thanks for doing the badge for the hop! What a clever use of that stamping. Pretty! You are a fine designer on all levels....love what you have done with all the designs and the hand flower or slave bracelet (so many names for this design) is crazy good. Love your colors too! Here's to looking at jewelry making from a new perspective! Keep em coming, Lynda! your colors are amazing!! Great job on thinking out of the box! I'm really loving seeing so many ways to use this stamping! The colors on this are gorgeous! oh and the purple fairy heart <3 so sweet!! Your colors are perfect with the opal stone. Then the brass accents are such a nice contrast. Lovely. Nicely done. Loved the colors you used and the way you patinaed the items and their design. Thanks for sharing. I just love the hippie in your style! The colors are wonderful and compliment the Opal on the bracelet. And, oh my goodness, what a glorious fairy! Amazing designs!! Lovely slave bracelet Lynda. I love your color choices. Lynda, this piece is so pretty and well done! Love your color scheme, too. Beautiful piece Lynda! Great imagination and color choice. Nice job, Lynda! I always love those glass opals. 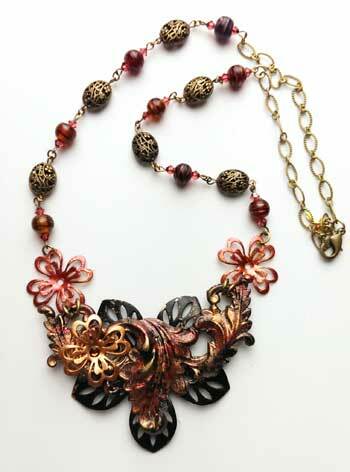 It sure looks great with your colorization of the brass, and the pretty floral wreath piece. I love purple, and I love what you created as much as I love purple! 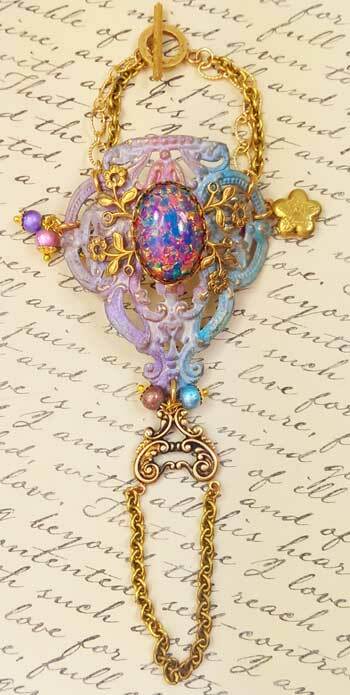 The heart with the butterfly winged fairy is so colorful, and so beautiful! Oh wow! That slave bracelet is out of this world beautiful. The colors, the design, everything! I have that cuff stamping and now I'm torn whether I should cut it in half or leave as is lol I love all the inspiration I'm getting from this blog hop. Great job Lynda! Great idea! Very beautiful colors. 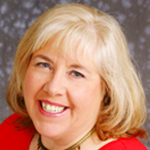 Hi Lynda you did such a good job on changing it up. Your bracelet is very pretty, love the colours. Making this style of bracelet is definitely on my to do list.